From Estates to Tenements: PBS' "10 Homes that Changed America"
On Tuesday, April 5, PBS premiered the first episode of a new three-part series "10 That Changed America." 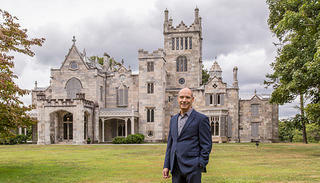 In its first installment, hosted by Geoffrey Baer, “10 Homes That Changed America” featured National Trust Historic Sites Lyndhurst mansion in Tarrytown, New York, and the Tenement Museum in Manhattan. We caught up with Baer to hear about his initial impressions of these sites and learn how they helped influence life in America. What was it like seeing these locations for the first time? One of the things that we all said when we would arrive at the location for the first time is it’s kind of like meeting a movie star. Because you’ve been studying this thing for so long and looking at pictures, just like you’ve seen a picture of a movie star all your life and then all of the sudden, there’s the movie star in person, right in front of you, and it’s always surprising. It’s either bigger than you thought it would be or smaller than you thought it was going to be. Certainly the architecture is the art of being able to conceptualize in three dimensions, and mostly when you’re researching you’re looking at two dimensional images. So suddenly you’re seeing the full three dimensions and walking through volumes of space that you’ve only imagined. You had never been to Lyndhurst before filming. What were your initial impressions? What struck me right away [at Lyndhurst] was the site and the grounds which are really inherent to the whole concept. Not only do we have the architect developing the building but also the picturesque landscape architecture. All of it as an ensemble was really interesting. It’s on a craggy cliff and so the Gothic architecture would be sort of contextual with the asymmetry and stone color. The building is almost like a cliff itself so that’s of course very interesting. I think what’s hard to wrap your brain around is that to us, to Americans, we look at it and think of cathedrals or universities or libraries in that Gothic style. But this was actually kind of modern in its time because they had all these modern amenities like bathrooms and radiators. And of the Tenement Museum? The Tenement Museum was one of the most emotionally moving experiences I’ve ever had in my life, no question, and it was certainly the most moving emotional experiences I’ve ever had in a museum. The feeling I had when I was exploring that building was, "I was never grateful enough to my grandparents." I’m a grandson of Russian-Jewish immigrants, they lived in Chicago in similar conditions: crowded, not a lot of money, immigrant communities all banding together to help each other. I’m living the life my grandparents envisioned for me. I am fulfilling the dream that they had. As are so many millions of Americans who are the children and grandchildren of immigrants who came and made this conscious sacrifice to live in these horrendous conditions. They knew they were trying to build a better life for their children and grandchildren, and we take it for granted. I never even think about it. So the idea that you can visit this museum and understand very viscerally what these immigrants went through for our sake was just tremendously moving to me. Lyndhurst was influential in a number of different ways. One is this ever-evolving notion of "what should American architecture be" which is very funny because it’s Gothic which is not indigenously American at all. But what’s American about it is that it is tailor-made for its owner, it is custom made for the needs and the likes and dislikes of the owner. And we can do this in America; we can pick and choose from whatever styles or references that we want to have something that fits us. It also is very much of the American landscape. It’s inseparable from its landscape. In America we have land; that’s what we have in abundance, and so our homes are part of a landscape. In terms of the Tenement Museum, it’s really in the housing reforms after Jacob Riis went in there with his camera and showed the conditions that movements began to reform these places. You had things like air shafts mandated to be carved in the middle of these places and rules about lighting in the stairwells and having adequate indoor plumbing. All these housing reforms came about as a result of these places. I think we can definitely stand behind our assertions that these were powerfully influential. For more information on the other eight homes that changed America, explore the 10 That Changed website.